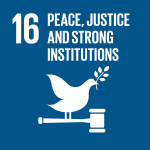 The Goal 16 covers a large part of the civil and political dimensions of human rights. It includes the right to to life, the right to be free from torture and slavery, the right to freedom of information, the right to political participation, the right to legal personality, as well as the right to access to justice. These are the right embodied in the Universal Declaration of Human Rights, International Covenant on Civil and Political Rights and other international human rights instruments, which mostly have been ratified by the GoI, namely the Convention Against Torture (CAT) and the Convention on the Rights of the Child (CRC). Most of these civil and political rights are also enshrined in the 1945 Constitution, as well as in the Law number 39/1999 on Human Rights. Moreover, with regard to the right to access to justice, Indonesia has passed a law on legal aid (Law no. 16/2011), which has been officially implemented since 2013. The law sets out legal aid as a right and guarantee the right to free legal aid for the poor. Indonesia is still struggling to resolve various issues regarding the protection of the civil and political rights of its citizens. With regard to the right to life, apart from the the ongoing practice of death penalty, deaths from excessive use of force by are still occurred, especially in conflict area like Papua. The National Commission on Human Rights (Komnas HAM) also reported that there were 230 reports on violations of the right to life in 2016 alone. Moreover, torture is still often practiced by law enforcement apparatuses. In 2016, Komnas HAM received 142 reports on torture. Furthermore, in the justice sector, Indonesia is also still facing problems with the accountability of its justice system. The World Justice Index 2015 scored Indonesian criminal justice system only 0.37, while the civil justice system is slightly better with a score of 0.47, in a scale of 0.00 as the lowest score, to 1.00 as the highest score. It reflects the necessity for GoI to improve the justice system in order to strengthen the access to justice for everyone. There are 12 targets under Goal 16 on the promotion of peace and justice, and the government found all those targets are in line with the national medium-term development plan (RPJMN) 2015-2019. 2. Strengthened children protection system, including the effort to protect children from violence, exploitations, abandonment and other mistreatments. (Book II, chapter 2.2.10) a. Decreased number of violence against children from 38.62% (for boys) and 20.48% (for girls) (source: Book II, page 2-74). d. The number of outdoor trials and people receiving court fees waiver: 15.981. (b) the implementation of international cooperation to resolve global issues threatening the humankind, such as infectious diseases, climate change, distribution of illegal small arms and drugs. (Book II, chapter 5, page: 5-43). a. The percentage of acceptability of Indonesia’s position in multilateral forum on the issues of international security, weapons of mass destruction and conventional weapons, transnational crimes and terrorism. b. Anti corruption law enforcement: 20% increase. 2. Good quality of bureaucratic services through a) institutional and service management strengthening; and b) capacity building of public services performance (Book II, chapter 7.3.2, page 7-41). 1. Unqualified opinion (WTP) status on financial reports: from 74 to 95 ministerial reports in 2019. 2. Capability level of the government internal auditor (APIP): from 1 to 3 in 2019. 3. The performance level of the government internal auditing system (SPIP): 1 in 2019. 4. Governmental agencies accountability performance (SAKIP): 85 agencies/ministries in 2019. 5. The use of e-procurement: from 60.24% to 80% in 2019. 6. The percentage of government agencies to achieve a good score on Bureaucratic Reform Index: 75 agencies/ministries. 7. Civil servants professionalism index: from 76 to 86. 8. National e-government index: from 2.66 to 3.4 in 2019. 9. National Integrity Index: from 7.22 to 9 in 2019. 10. Public satisfaction survey: from 80% to 95% in 2019. 11. Compliance percentage of the implementation of the Public Service Law: from 64 ministries and 15 agencies to 100 in 2019. 16.7 Ensure responsive, inclusive, participatory and representative decision-making at all levels. – Guarantee and fulfillment of civil liberties, political rights and obligations of the people, and the increased of women’s political representation (Book II, 5.2.1 & 5.3.1). – Women’s representation in political parties: 30% in 2019.
b. Indonesia’s leadership percentage in multilateral forum: 78% in 2019.
c. The percentage of children who have birth certificate: 85% (Matrix II.2M-16). c. The percentage of inquiries and recommendations being followed up with regard to the issues of violence against women, human rights protection of women —- the percentage of reparative systems being developed for victims of human rights violations: 20% annually. d. The number of gross violations of human rights being resolved (Matrix II.7.M. page.33-43). e. The percentage of public institutions to implement the provision of Public Information Openness: 80 % of institutions. f. The number of basic regulations on public information dissemination and parity: 6 regulations. g. The percentage of public access to media: 90%. b. Increased number of handling of human rights violations reports: 7000 reports being handled by 2019. (Matrix II.7M-34). The GoI has covered almost all important aspects to improve the promotion of peace and justice in Indonesia. However, there are some gaps that are important not to be overlooked with regard to more definitive indicators on some targets. As reducing violence and related deaths rates are strongly related to the fulfillment of the right to life, it is important to monitor the progress of target 16.1 by setting up indicators that can reflect the state of security and safety enjoyed by everyone in all regions in Indonesia. While, although the GoI has ratified CAT since 1998 through the adoption of the Law number 5/1998, Indonesia still has not established torture as a punishable act. This has contributed to the widespread use of torture among law enforcement, as well as military, personnel. Therefore, it is important to aim for the adoption of a legislation providing torture as a punishable act and to end impunity for the perpetrators of torture. In light of the gaps in the indicators under Goal 16, we would like to propose the following additional indicators to strengthen the impacts of the national development strategy to promote peaceful and inclusive societies and access to justice in Indonesia. – Proportion of population that feel safe walking alone around the area they live. – Adopt a legislation which includes the provision of torture, cruel and unusual punishments, and inhuman treatments as punishable crimes. The UN Office on Drugs and Crimes (UNODC) and the UNDP may provide a great assistance for the GoI to achieve all targets aimed under Goal 16, as the two UN programmatic agencies have both the expertise and experiences in assisting the GoI in combating extreme violence, terrorism as well as developing a strong and accountable justice sector.